Inquire now to see how much you can save. Looking for the best rate on auto and/or home insurance? We can help! Our licensed insurance professionals do the shopping for you, saving time and money. We compare rates from highly-rated insurance companies—names like Travelers, Progressive and Safeco Insurance®. SelectQuote Auto & Home focuses on each client's unique needs so we can find the best policy for you and your family. I saved over $600 per Year! 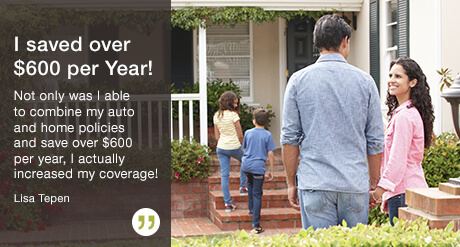 Not only was I able to combine my auto and home policies and save over $600 per year, I actually increased my coverage! *Average customer savings based on an average of new SelectQuote Auto & Home Insurance policyholders between 7/1/2016 and 6/30/2017. Individual savings may vary, and are not guaranteed. Coverages and discounts subject to state availability and individual eligibility. Savings do not apply in the state of Massachusetts. SelectQuote Insurance Services offers insurance products and services through its licensed insurance agency, SelectQuote Insurance Services, LLC. SelectQuote Insurance Services is not an insurance company. We represent top-rated insurance companies, and receive commissions – and possibly other performance-based compensation – for our services. Products and services are not available in all states.